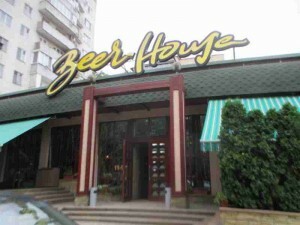 This is one of the bars in Chisanau. It’s listed by Lonely planet as a good place to drink. When I looked at Lonely Planet’s advise on what to do in Chisanau in two days, they said to go out at night and drink a lot. They said that Chisanau’s party atmosphere is rated really, really good. Maybe I should have spent more time in the bars in Chisanau. Let me rephrase that. Maybe I should have spent some time in the bars in Chianau. But I didn’t. The main reason why is that there is some documentation that tourists in Chisanau are hustled every chance someone gets and some of the biggest opportunists that exist for scamming tourists are the police. They seem to have a reputation for providing tourists with on-the-spot fines or a variety of ridiculous trumped-up infractions. I would never ask police in Moldova for help with anything. I especially wouldn’t let them catch me out at three in the morning with alcohol on my breath. While I’m not generally paranoid of police, I do exercise caution when multiple sources of travel information for certain locations say that the police can cost me some loot just for being a tourist.